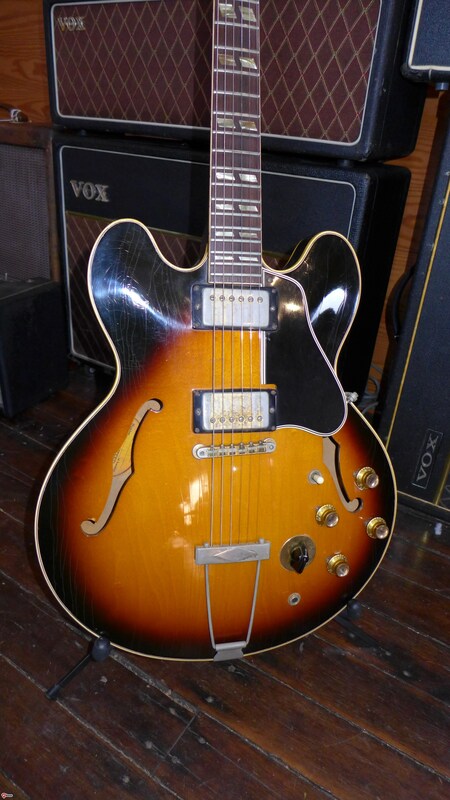 Very unusual 66 ES-345. Look at those ears…M-I-C-K-E-Y you know the rest. Stranger things have come along but not many. I write frequently about how to identify the various years and models of ES guitars and, mostly, they follow a pretty predictable set of rules. Except when they don’t. Just when you think you’ve got it nailed down, something comes along and you say to yourself…”see, anything is possible at Gibson in the 60’s…” And, by and large, it is. I’ve written about a number of oddballs over the years. 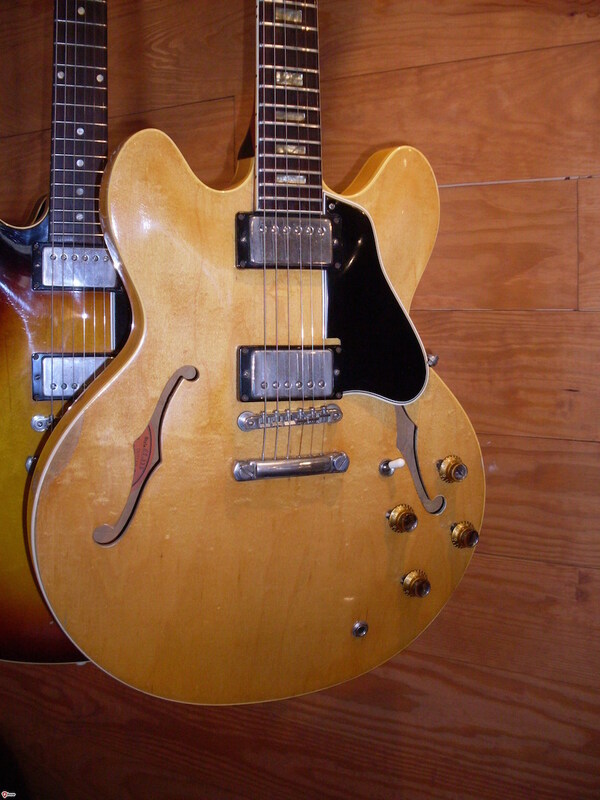 Recently, I bought a 66 ES-345. It’s the third one I’ve seen with Mickey Mouse ear cutaways. Those were gone by mid 63, so the idea that they were left over bodies is remote. But there they are. I’ve seen some kind of rounded, almost MM ear 66’s and with the hand work that went on, I suppose some variation is likely but this one is dead on. OK, big deal, I wrote up the first one a couple of years ago. Everything else about that one was typical 66. The neck was 1 9/16″ at the nut and the depth was a pretty typical .80″ or so at the first fret. Not this one. First off, the nut is 1 5/8″. Not unusual on a 65 but not usual at all on a 66. Being a fairly low volume model, the neck could have been left over from 65. But then there are the other measurements. This one is .87″ at the first fret and a whopping 1.02″ at the 12th. That’s 58-59 territory. Not even the 64’s reach .87″. Custom order? Maybe but there was no “Custom” truss rod cover which is pretty consistent on custom orders. Employee guitar? I have been told by a Gibson employee from the 60’s that the employee guitars had to have “2” stamps (even if they weren’t “seconds”). Somehow, that neck is outside the “normal variation” bell curve that 60’s ES’s seem to exhibit. An outlier, if you will. That’s one of the things that is so much fun about 60’s Gibsons (I still say “so much fun” rather than “so fun”-that still sounds wrong to me) is that there are these rule breaker guitars. When I buy a guitar sight unseen from an individual, it’s still an adventure (or a crapshoot depending on your attitude)-even after many hundreds of them. It still feels a little like Christmas morning when I open a guitar box-especially one bought from Ebay or Craigslist. Mostly, the surprises are not so good-changed harnesses, wrong bridges, changed pickups and on and on. When the widow or the family is selling the guitar, it really isn’t fair to ask them to start taking the guitar apart. You look at the two or three photos they provide and hope for the best. Sometimes you get a bad surprise, sometimes you get a good surprise. It would be nice to say that the good surprises outnumber the bad ones but they don’t. That’s simply part of being in this business. But, to be truthful, the good surprises usually outweigh the bad ones. Getting a set of double white PAFs in a 61 when you didn’t even ask if the guitar had PAFs is a good surprise. Getting a 76 harness in a 59 dot neck is not. And, really, you can’t point a finger at the widow of the original owner and say “you didn’t disclose this…” There are no returns in these cases. You simply make the best of it and hope you get it back to being correct and playable. The point here is not so much that Gibson was full of surprises back in the day. They weren’t. Most of the guitars I get follow the timeline pretty well. But then there are some that don’t and sometimes they don’t in a wonderful way. It’s often a big gamble when you’re spending thousands of dollars on a guitar that you’ve seen perhaps 6 photos of and have no hope of recourse from the 86 year old seller. But, in this case,the Mickey Mouse ears were right there for everyone to see. So how come I was the only one interested? Well, it’s that crapshoot thing again. And besides, that’s why I’m here. Speaking of unusual, my friend Richie just bought this very rare and very cool 64 Bigsby only. These are are rare to begin with but this one has ears that don’t match. How many martinis did you have for lunch? Biggest surprise had to be the blonde block neck I found in March. One of only two known. That’s rare. Call it the Year of the Blonde. This past year, the value of blonde 335’s started approaching the 2007-2008 level and I’m not surprised at all. A very few stellar examples turned up in 2015 including two stunning birdseye topped late 58’s, a killer flame top Bigsby 59, a 63 blonde block neck and a 59 blonde 355. In a time when great examples are getting really tough to find, it was both astonishing and gratifying to see these stunning guitars see the light of day. I didn’t have all of them (OK, I had two of the ones I mentioned). I wouldn’t be surprised to see top quality blondes passing the $100K mark in 2016. In general, dot necks were very, very strong in 2015. Part of this is due to the fact that really clean ones are getting scarce. They really didn’t make all that many to begin with and so many are already in the hands of collectors that the few still with their original owners or owner’s families just don’t come up that often. That said, even the player grade 59’s are selling at very strong prices. You aren’t likely to find a 59 under $30K any more. Unbound 58’s continue to be fairly strong but bound 58’s are a standout. 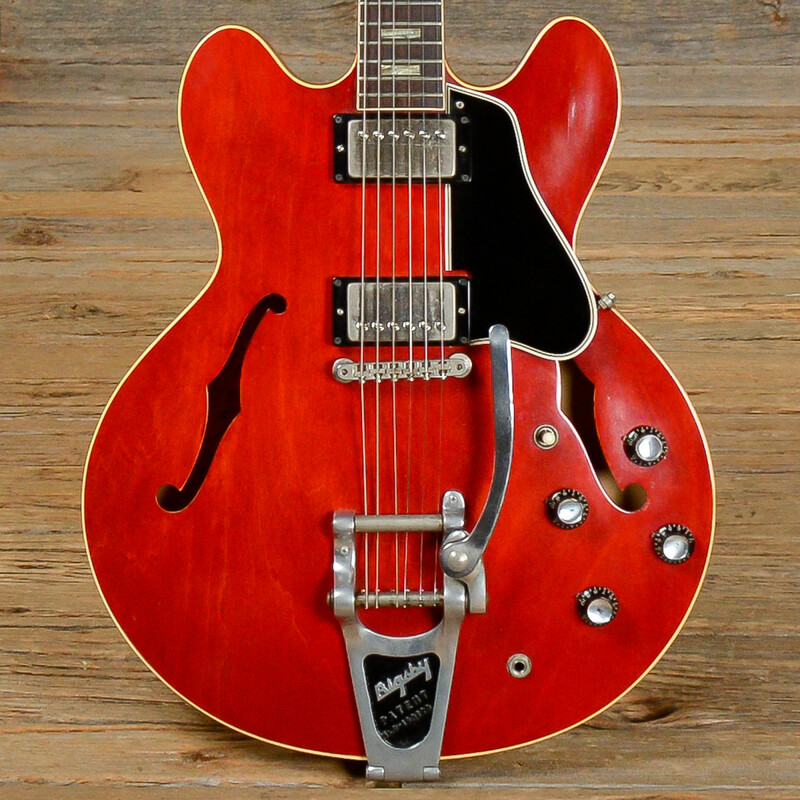 Early 60 dot necks are right on the tail of the 59’s. Neck size still counts and that’s what keeps the later 60 and 61 dot necks well below $30K unless they approach mint condition. That same desire for a big neck has kept most of the block necks from moving very far upward in value in the past year. A red 64 used to be the easiest 335 to sell, especially right after the market corrected but now they seem to have slowed to a crawl. 62 and 63 blocks with PAFs sell better than those without although the asking prices are pretty close if not the same. The bigger neck 64’s still lead the pack in terms of sales but not by all that much. Maybe the era of the big neck is winding down. Based on the folks who come into my shop and actually play multiple 3×5’s, the consensus is that the huge neck is a great talking point (mine’s bigger than yours) but when it comes down to actually playing the thing, the medium and smaller necks are getting the nod from the buyers. For many, they are simply easier to play. The narrow nut versions are still considered less desirable but “wide flat” and “wide slim” are not the dirty words they once were. This may signal a coming trend that will see late 60 and 61 dot necks bump up to closer to the levels of the 58-59’s. We’ll just have to wait and see. I think many players can adapt to almost anything but there is an odd paradox that still baffles me. 2015 was great fun for me. I found (or lucked into) some very cool guitars. The aforementioned blondes, a black 345, a blonde mono 355, a 59 red dot neck with a Varitone, a killer red 60 and quite a few others. And they came from some surprising places. The blonde 63 block came from somewhere in the north of Scotland (beyond the wall to you Game of Thrones fans). Lots of 335’s made the trip back across the pond from Europe this past year probably because the Euro was so weak and the dollar was so strong. But some still go the other way. Thanks to all the readers who keep me doing this and to all the buyers and sellers who make this business so much fun. Bigsby 345’s had a tough year. That makes them the great bargain going forward. PAF guitars for under $10K WooHoo. Well, the doom sayers have it wrong again. There are folks who predict the vintage market will fall apart any minute because the only people buying vintage guitars are really old (like 50 or, gasp, even 60). 2015 was a very strong year for sales over all and, for some models and years, approaching 2007-2008 in values. While the doom sayers are largely correct about who buys the guitars, the market for younger buyers is expanding all the time. I get twenty somethings in my shop all the time and they love the old stuff. Even if they can’t afford it today, my feeling is that they’ll be back as soon as they can afford it. The older Gen Xer’s have already started buying the high end stuff and that bodes well for the market going forward. So what sold in 2015 and what didn’t? Blondes were hot. It’s gotten so hard to find them that when a good one comes up in the market, everyone takes notice. 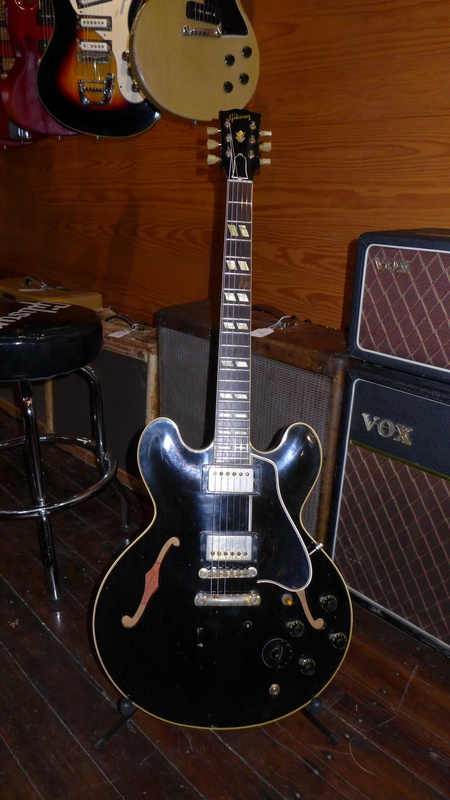 I’ve heard predictions of the $100,000 ES-335 being imminent (in fact there is a 59 on the market for that price but it hasn’t sold). I know of a 59 that sold for $95000 this year as well. The blonde 59 ES-355 that emerged earlier in the year changed hands for some serious money as well, although I don’t know the exact amount. Rumor has it that it was in the $90K range but that’s rumor. As far as I know, no blonde 345’s emerged this year at all-there are only 50 of them. In a recent post on the Les Paul Forum about a certain black 59 ES-345 (that happens to be mine), Joe Bonamassa made the prophetic statement that “black is the new blonde”. And perhaps he is right. Three black 345’s have emerged recently. One is a late 59 or early 60 Bigsby, the other two are “first rack” ’59 stop tails. One has an added Bigsby, the other is stop tail only. There are so few of these its really hard to put a price on them. Big price aside, everybody seems to love a black ES probably thanks to the black 59 ES-355 played by a certain Mr. Richards. It is a market phenomenon that when the prices get high enough, the rare stuff comes out from under the bed. Speaking of 345’s, this was not their year. 59’s, especially early ones (black VT ring, big neck) have been strong and other 59’s have been stable but later ones have really languished. Bigsby 345’s from 1960 and later are, at least for now, dead. I’m sure they will come back but these guitars were well into the $12K range not long ago and now I’m seeing them for $8000 and even less. The big dealers are Ebay sellers are still holding out hope that they can get $15K for a Bigsby and $20K for a stop tail but that’s wishful thinking unless the guitar is dead mint. I sold a 9.0 stop tail no issue (converted to mono) 1961 for $10,500 and it took me a year to sell. That makes them the bargain going forward. These are great guitars and are a deal and then some under $10K considering what the new stuff is going for. 355 Monos had a great year. I can’t keep them around-especially 59’s. They are wonderful guitars and have crept up in value all year. A really clean mono 355 has certainly hit the $20K mark (and lots of the 59-61’s have double white PAFs). 355 stereos are stronger than 345’s but they haven’t got the “easy sell” liquidity of a mono. They also don’t have the big price. These, like the Bigsby 345’s are a great deal in ES’s right now. Liquidity is important. A valuable guitar isn’t all that valuable if it’s time to sell and there’s no market for it. 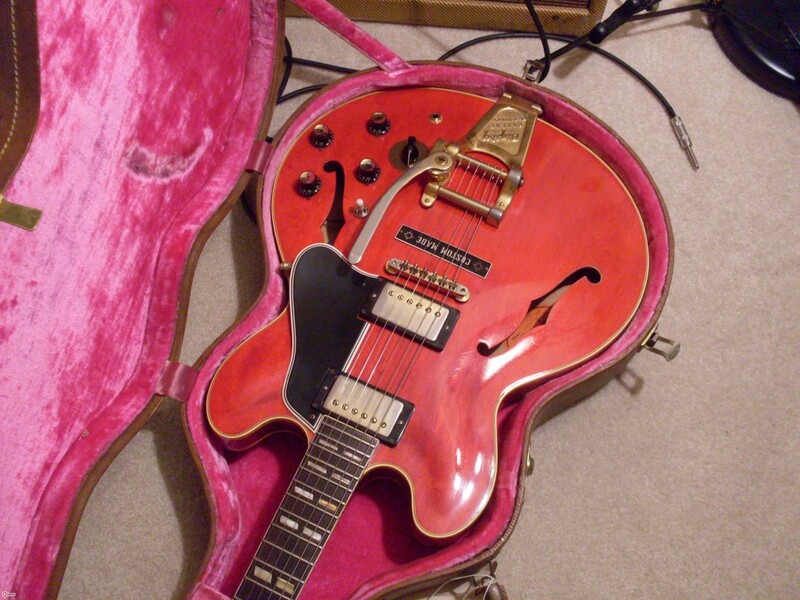 Tried to sell a big archtop lately? Big numbers, no buyers. This is getting long so we’ll split it into two parts. Next, we’ll look back at 2015 for 335’s. Dots were hot. Blocks, not so much. Joe Bonamassa says “black is the new blonde” and I think he might be on to something. Watch black guitars in 2016. They will be smokin’ hot.